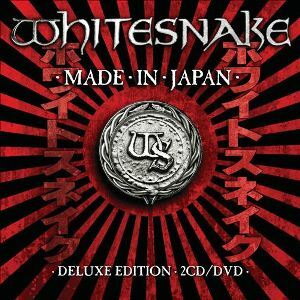 Whitesnake's new live album/DVD 'Made in Japan' is their first live release since 2011, but since that release was recorded in 1990 then its really the first new live recording since 2006's 'Live in the shadow of the blues'. Since the band have released two studio albums since then, this means there is plenty of new material that hasn't been released on a live album so far, and indeed on the 2CD+DVD package you'll find five tracks from the two latest studio albums. It's nice to see this release available in a range of formats - DVD, Blu-Ray or DVD/2CD. If you're only really interested in watching the video then you can choose between the DVD and Blu-Ray options, but personally I much prefer live albums on CD - with a DVD then I only watch them infrequently whereas on CD I tend to listen far more as I have music playing while working, reading etc. The DVD/2CD package gives the best of both worlds - the DVD to watch when you have some time, as it's always good to see the band's performance, and the CD for listening to the rest of the time. The DVD/2CD package has the first CD containing the same songs as the DVD, but the second CD contains a different selection of songs. The songs on this second CD were recorded on the Japanese leg of the 2011 Forevermore tour, while the DVD and first CD come from the festival appearance at Loud Park in Japan on 15th October 2011. The festival performance was recorded for Japanese TV and future Loud Park promotions, but after three songs were broadcast on a Loud Park highlights program in Japan, Whitesnake fans were soon asking them to release the whole show, so thanks to demand from fans it is now being released as 'Made in Japan'. The band sound fantastic on this release. Any reports from critics that David Coverdale's voice is shot can safely be disregarded. Okey it's not quite as strong as it was 30 years ago, but it's still one hell of a voice. It's a great performance - Whitesnake are at their best playng live as fans who attended the recent dates with Journey and Thunder will agree - they blew Journey off the stage with their perfomance. The DVD is great - filmed from multiple cameras with good picture and sound quality, and it's great to see the band performing - while some bands pretty much stand there like waxwork dummies and play, Whitesnake are very active moving around the stage, posing and generally putting on a show. It's a great live release; a great selection of tracks and it sounds fantastic - well worth buying.